The crowd of nearly 60,000 roared Saturday (Nov. 3) as Darth Vader led stormtroopers out of the northwest tunnel onto Hollingsworth Field at Vaught-Hemingway Stadium. 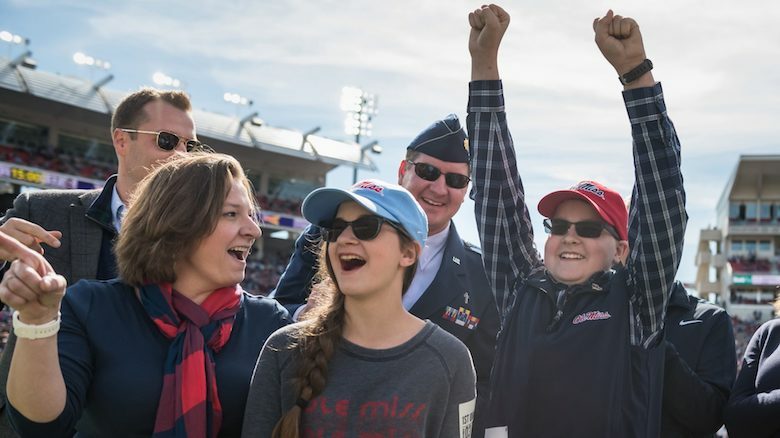 Standing alongside his family, 13-year-old Benjamin Clark, sporting an Ole Miss cap and vest, threw up his hands and cheered as the legendary Star Wars character approached with a signed football from Rebel coach Matt Luke. Benjamin’s illness has forced him to deal with things most other teenagers do not have to think about. 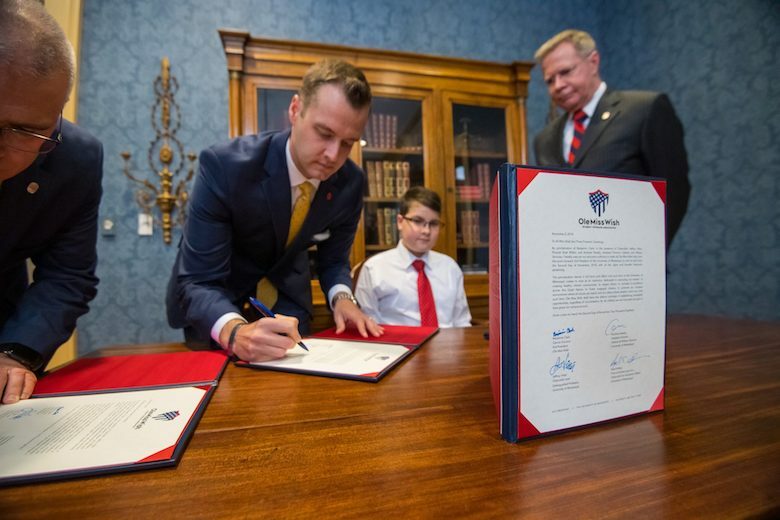 It’s his ability to deal with these hardships that attracted Newby and the Student Veterans Association to Benjamin and made him an easy choice for Ole Miss Wish. Walkers for Warriors co-founder Nicholas Roylance, a theatre major from San Francisco, joined the Clarks on the sidelines Saturday to celebrate their trip. Like Roylance, Benjamin is a big Star Wars fan, and the costumes and pageantry of the presentation fit the Walkers for Warriors style. “Throughout Benjamin’s whole cancer journey, people are like, ‘I don’t know how you do what you do,’” she said. “But you just do what you have to do. We’re just dealing with the hand that we’ve been dealt. We don’t do anything extraordinary.